The Cycladic-style Stefani Suites is perched on the cliffs of Firostefani and offers accommodation with spectacular views of the caldera. 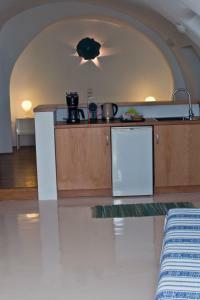 This studio, built in a dome-shaped cave, has a veranda overlooking the caldera, a small kitchenette, flat-screen satellite TV and Cocomat beds. Located a few steps away from the common hot tub, this junior suite includes a Nespresso coffee machine, a flat-screen TV with satellite channels and a Cocomat bed. 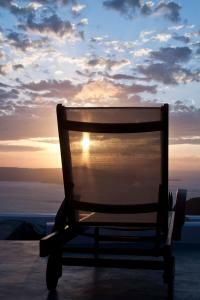 It also has a spacious living area, a modern bathroom and a veranda with views of the caldera and the volcano. 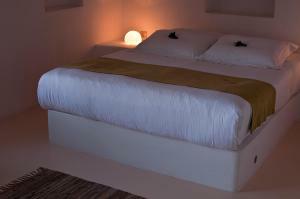 The double bed can be converted into 2 single beds. Cooking is not allowed in the kitchen area. This vaulted suite is located in a traditional cave and features a large seating area, a Nespresso coffee machine, a flat-screen TV with satellite channels and a Cocomat bed. 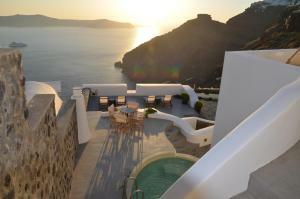 It opens onto a large porch with views of the caldera and the volcano. This vaulted suite is in the highest area of ​​the complex and opens onto a large porch with stunning views of the volcano and the caldera. It has an elegant seating area, a Nespresso coffee machine, Cocomat beds and a flat-screen TV with satellite channels.